It's been a long time coming, but Europe's oldest marathon finally went sub 2:10 as unheralded Kenyan William Biama won in a great solo effort writes Alfons Juck. The 84th edition of the race enjoyed favourable conditions (13°C, no wind) and the participation of more than 3000 runners from 40 countries in the marathon and various support races. For 22-year-old Biama it was only his third marathon. 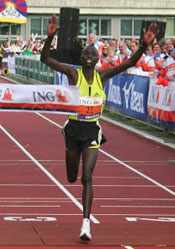 Alongside the much more experienced Simon Bor, (2:07:55 from 2003) by 10km (30:25) they had already dropped the pacemakers. Through halfway in 1:03:50, it seemed inevitable that they would fade in the second half, but while Bor did so (after 30km) Biama was still running well. Watched by Slovak President Ivan Gasparovic among the spectators Bima delivered in fine style. "I did not have any big crisis, only at the end when I was a little bit cold… next time I think I can run close to 2:07," he said. Bor, in his 21st marathon, also beat the old course record. Natalya Kulesh defended her women's title and set a new personal best of 2:34:50, fourth fastest ever in Kosice. The 2005 race winner Edyta Lewandowska finished two minutes behind her. Member of Parliament and former Slovak Prime Minister Mikulas Dzurinda finished his 21st marathon after leg surgery in very solid 3:35:13. Over 5600 runners lined up for Baxters Festival of Running, with thousands lining the final few miles along the route in the autumn sunshine to support the runners as they came into the Queens Park Stadium in Inverness, the finish venue of all three races. Runners, together with their families and friends, enjoyed a carnival atmosphere, with entertainment including pipes and drums and ceilidh bands. For the kids there was a bouncy castle, Baxter's Soup and face painting. The event attracts elite Scottish and international athletes and club runners, but is also hugely popular with amateurs, joggers and those running to raise money for charity. Last year's event raised £408,311. Fifty different nationalities were represented, with athletes from as far afield as Australia, Brazil, Japan, Kenya, New Zealand and Trinidad. The Festival of Running has a tremendous impact on the local economy as runners, their supporters and locals alike soak up the race weekend atmosphere; almost $2 million was spent on accommodation, food and activities in 2006, and certainly more this year. The 28th edition was a showcase for Victoria-based athletes as well as proving that the Masters field is one of the fastest in the country. Steve Osaduik couldn't match his record-breaking 2006 time, but still strode away to finish nine minutes clear. Men's 40+ and 50+ masters winners finished in third and fourth places. In the women's marathon Suzanne Evans made it three wins in a row, with a personal best of 2:45:38. She and American Wendy Terris jockeyed together for most of the race but the diminutive Canadian proved to be the stronger. In the Half Marathon Victoria's Lucy Smith achieved her goal by breaking her own 2003 race record by a single second. Another local favourite and past Marathon winner, Bruce Deacon, set a new course Masters record of 1:08:02. Sydney Olympic Triathlon Champion Simon Whitfield won the 8km race in 24:23. In ideal conditions (16°C, sunny, no wind) Philip Singoei defended his title and bettered his 2:08:08 course record from last year writes Wim van Hemert. It was Singoei's fourth consecutive Eindhoven. 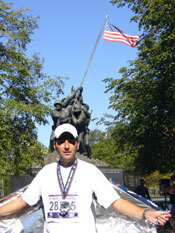 In 2004 and 2005 he finished second in 2:10:07 and 2:08:45 respectively. "I love this course," he said afterwards. "I was very confident to win." A big group of Africans went through 10km in 29:40 but at 15km (44:36) they were reduced to four: Singoei, William Todoo Rotich (who eventually did not finish), Joseph Ngeny Kiprotich and pacemaker Charles Koech. At halfway Koech stopped and the other three were on their own. The pace stayed very fast as the trio passed 30km in 1:29:57. Rotich dropped back at 33km and soon after that point he stopped. Just before 35km Singoei accelerated and left his last rival. In the last 7km he opened a gap of nearly two minutes. Lydia Kurgat was a comfortable winner in the women's race, well ahead of compatriots Tabitha Kibet and Eunice Korir. The event drew a record 16,046 participants: 1775 in the marathon, 8135 in the half marathon and 6830 in the City Run (6km). Kicking from a tight four man pack in the last kilometre, Zersenay Tadese of Eritrea successfully defended his title writes Bob Ramsak. 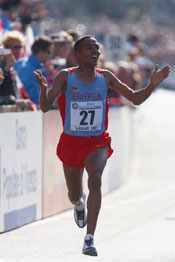 Tadese, also the reigning World Cross Country champion, set a new championship record of 58:59. Taking advantage of ideal conditions and a fast three-lap course, the race was quick from the start. A lead group of eight went through 5km in 13:55. Past 10km (27:35) Tadese and Ethiopia's Deriba Merga ran stride for side with Patrick Makau and Evans Cheruiyot a step or two behind. These four passed 15km in 41:35, just five seconds shy of Sammy Wanjiru's 41:29 set earlier this year. Cheruiyot then dropped back a few metres but worked his way back to rejoin the leading three at 20km (56:13), just as the 25-year-old Eritrean made his decisive break. Tadese surged down the slope into the Piazza 1 Maggio with a clear lead and 500m to run, but Makau launched an attack at 300m that saw him rapidly close down the gap. Tadese, sensing the danger, responded to Makau and to the crowd of 200 or so jubilant Eritrean fans who lined the finish straight. Tadese joined an exclusive group of sub-59 minute performers over the distance and became only the second man, after Paul Tergat, to defend his title. 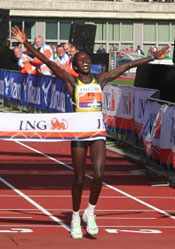 World record holder Wanjiru, in his debut for Kenya, had raced to the front at the start but then struggled. Running with a knee injury, the fast early pace took its toll. A distant eighth and 18 seconds behind at 10km, he eventually crossed the line 51st, clocking 1:03:31. A total of 17 runners bettered 61 minutes. Holland's Lornah Kiplagat bested her performance of last year at the same Championships in Debrecen (HUN) to improve her 20km World record to 1:02:57. She went on to complete the half marathon distance in 1:06:25, beating Elana Meyer's 1999 figures from the Tokyo Half Marathon by 19 seconds. Kiplagat led from the start but at about 10km Kenya's Mary Keitany had the temerity to challenge her and pulled ahead to lead by a few seconds. Kiplagat, who had been injured for several weeks in July and August, was slow to respond but gathered her strength and pushed ahead from about 13km. It took her a while to shake off the tenacious Keitany, who was still only three seconds down at 15km. Thereafter Kiplagat gradually pulled away to a 23-second win, which could have been more but for celebrations before the finish line. Keitany finished just outside the old record in 1:06:48, improving the Kenyan national record by a single second. Pamela Chepchumba ran a personal best for the bronze medal and along with Everline Kimwei in 6th place ensured an emphatic team victory for Kenya. In fourth place Bezunesh Bekele lowered Berhane Adere's Ethiopian national record by 10 seconds and of the top 20 finishers, 17 recorded personal bests. 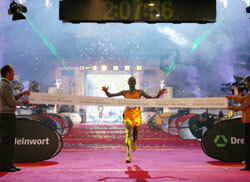 Kiplagat's victory follows that she achieved in the World Cross Country in Mombasa back in March. She has represented the Netherlands for the last four years since marrying husband/coach Pieter Langerhorst. The race passed a milestone by attracting runners from more than ten countries for the first time. Nebojsa Kosic from neighbouring Serbia won the men's Marathon in great style and Hiroko Ogawa from Japan dominated the women's competition. 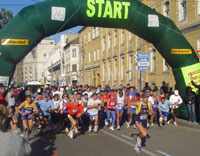 Runners enjoyed both marathon and half marathon events in sunny conditions, on a fast course and against the beautiful backdrop provided by the historical city of Timisoara. Beside the main events there was also a "Bambi Marathon" for 4 to 6 year old children, over a course of a few hundred metres. Ideal weather (10-12°C and sunny but with no wind) allowed fast times in a race which was not determined until the final 250m inside the 1928 Olympic Stadium writes Wim van Hemert. Emmanuel Mutai clocked the third fastest time in the history of the event and the second fastest time of the year. 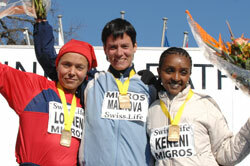 Compatriot Magdaline Chemjor won her debut marathon. Mutai earned the victory by his strong front running. After a moderate start a large group of runners held together through 10km (29:55) and halfway (1:03:56). After this point, outside Amsterdam by the River Amstel, the pace increased as some pacemakers dropped out. The lead group diminished but still numbered 11 runners who passed 25km in 1:15:32 and 30km in 1:30:20. By 35km (1:44:55) there were three leaders: the Kenyans Mutai and Richard Limo and Yonas Kifle of Eritrea. Kifle lost contact and was overtaken by the Kenyans James Rotich and Paul Kirui at around 41km. Mutai and Limo battled on but in the last kilometre Mutai succeeded in breaking away from his final opponent. Rotich and Kirui stayed together until the last stride both clocking the same time for third and fourth place. Mutai's previous best was a modest 2:13:06 from Rotterdam in April. Dutchman Kamiel Maase gave himself a nice present, a day after his 37th birthday, by finishing ninth with a new Dutch record. He bettered his old national record, which he also set in Amsterdam four years ago, by exactly ten seconds. Magdaline Chemjor dropped her last opponents, Ethiopians Marta Markos and Ayelech Worku, at 35km (1:44:47). The experienced Pole Dorota Gruca was very strong in the final seven kilometres, coming through to take second place. Over 8000 runners took part in the Marathon while another 16,000 competed over the other two distances. Under warm sunny skies, Kenyan Nephat Kinyanjui kicked away in the final kilometre to win the race in a personal best by more than three minutes writes Jiang Yi. Chinese youngster Ren Longyun had run shoulder-to-shoulder with Kinyanjui for most of the race and finished 30m behind in a new national record, while Han Gang also broke 2:09. In the women's race a trio of Chinese teenagers swept the podium. "The weather actually helped quite a bit," said the 19-year-old winner Chen Rong. "The last 5km was very difficult, so winning it with my personal best of over seven minutes was a big surprise." Boding well for Chinese fortunes in this event, runner-up Yingying Zhang is just 17, and third-placed Xue Bai 18. Both produced career bests. It took nearly 20 minutes for all 25,000 runners to leave the National Olympic Sports Centre, one street across the Bird's Nest (National Stadium) and the Water Cube (National Aquatics Centre), the two main venues for next year's Olympic Games. There were 68 male and 21 female elite runners in this year's race, with a decent crowd lining the streets along the way. The 26th edition of the race coincided with the last day of the Chinese Communist Party's 17th Congress, held once every five years. While the date and route of the 26-year-old event were set a year ago, the date for the congress was announced only in late August. Instead of starting in Tiananmen Square in central Beijing, the race start/finish was moved to the National Olympic Sports Centre in the north part of the capital. Aniko Kalovics scored a back-to back win while Kenyan Noah Serem took the honours in the men's race with a personal best writes Diego Sampaolo. 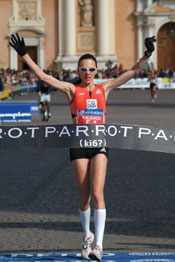 Ornella Ferrara, a former Marathon world championships bronze medallist now aged 39, ran well in her comeback competition after undergoing surgery twice in the last two years. Kalovics had already declared herself below her form of last year, when she set a Hungarian record, but she took the lead at 10 km, and built up a 45-second lead by 15 km (52:27). She passed halfway in 1:13:53 and increased the gap on Ferrara to 1:06 at 25 km (1:27:46) and to 1:45 at 35 km (2:03:10). She ran the second half in 1:14:24 for the third Marathon win of her career. "I wanted to dip under 2:28 but it was too cold today," Kalovics said. Ferrara was delighted with her second place in her comeback competition. "I hoped to run under 2:30. But considering that I have not run a Marathon race since December 2004 I am happy," Ferrara said. In third, Justina Bak smashed her personal best by ten minutes. Reigning Olympic and European champion Stefano Baldini made his final test for the ING New York City Marathon by running 25 km in Carpi, which is located just a few kilometres from his home town of Castelnovo di Sotto. Baldini showed progress after a difficult 2007 season, running the first 25km alone. The Italian marathon hero reached 1:04:57 at the halfway mark and finished his test at 25km where he clocked 1:17:02. After Baldini concluded his day, four Kenyans remained in contention for the final victory: Serem, Biwott, Cheruyiot and Willy Korir. Biwott was the first to attack at 31km but the others held on. At 36km Serem attacked and this time only Biwott resisted. Serem maintained the pressure and at 37km had established a six-second gap which he held to the end. Race organisers presented plans for next year's celebrations of the century anniversary of the famous Marathon race of Italian Marathon legend Dorando Pietri at the Olympic Games in London 1908. A monument dedicated to the great Italian runner will be unveiled. A book "The race of the century", written by athletics historian and journalist Augusto Frasca, was presented to the Italian media. The celebration will also be marked by the issue of a series of special stamps and postmarks and a set of illustrated postcards will be printed. Once again the 15th edition attracted more than 10,000 entries in all events, although the cold (3°C at the start) may have kept more than normal at home on race morning. The race favourite Weyessa Urguessa was three minutes late in starting. Meanwhile a group of other Africans led the race. After 31km it was down to what appeared as twin brothers as Kwambai Kipchumba and Kiptoo Kolum left their last challenger, Lamma Fikade, behind. Running with symmetrical action, it was a pleasure to watch, with nothing between them until the final turn where Kipchumba went ahead. His time is the third fastest recorded in Lausanne, behind Tesfaye Eticha's 2:10:05 in 2003 and his 2:11:22 in 2002. 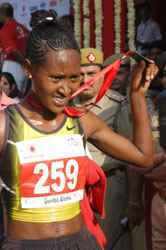 In the women's race two Ethiopians, Keneli Chala and Elfenesh Malaku were also four minutes late in departing. Under these circumstances Jeanna Malkova had little difficulty in taking the win. In the half marathon Sabine Fischer, a former 1500m specialist (9th in the Sydney Olympic Games) won with a time of 1:13:06 which put her on top of the Swiss rankings and would have placed her 7th in the men's race. Hugo Raemy took the men's title in 1:10:55. Last year this was the fastest marathon in Portugal, with a sub 2:10 winning time, but this year the weather was very hot and winner's time was much slower. But Marisa Barros, from the Azores, broke her personal best and the race record with 2:31:31, and also obtained the Olympic qualifying time. She maintained the unbroken run of victories for Portugal in the women's race. The course is flat and fast and shows the best of the city, combining seaside and riverside. The Half Marathon was run over the second half of the marathon course, which was of some help to the marathon runners. In all three races - there was also a mini marathon - a total of nearly 7,500 runners took part. The 2008 race is scheduled for 26 October. The race featured a course that circumnavigated the historic city, starting at Hwangsung Park. It was the first international field since 1997 as the race lapsed into a domestic competition after foundation in 1993. 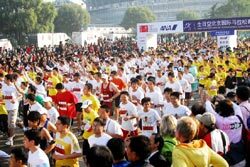 Invited runners from seven countries and 100 Korean elite marathoners ran along with 10,793 others. After 1997 the Dong-A Marathon changed into the Seoul International Marathon, but the Gyeongju Marathon has remained as an autumn competition for serious local and national runners. With this rebirth as an international event the race showed that it could become one of Korea's two major marathon competitions. The good weather and flat course allowed fast times, with the promise of more to come in future years. Kenyan runners swept the first five places in the men's race. Dieudonne Disi, sixth in the World Half Championships two weeks previously after a meteoric rise to form over the last year or so, destroyed a talented field by fierce front running. He passed through 5km in 13:35 and 10km in 28:20. He gradually worked his way clear of all opposition except for Isaac Macharia, who had held back in the early stages and ran together with Disi as they worked up a big lead. But Disi was not to be denied and had enough left to sprint clear in the final few hundred metres. Alice Timbilil took charge of the women's race and went clear with a pair of Ethiopian runners, Atsede Habtamu and Deribe Alemu. Like Disi and Macharia in the men's race, these three together forged a big lead and the race was determined only in the sprint for the line, won by Alemu. Both winners successfully defended the titles they won last year, Lenah Cheruiyot with a new course record and personal best time. Jonathan Kipkorir won a tactical race to finish ahead of the winner of this year's Turin Marathon, Philemon Kirwa. Wilfred Kigen broke his own course record in winning for the third successive time writes Pat Butcher. 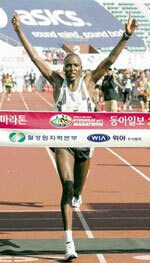 But he was headed for most of the way by Hosea Rotich, running only his second marathon. 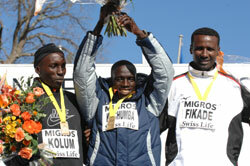 Kigen proved the tougher in the last kilometre, pulling away to win by 80 metres from Rotich, who ran a personal best. Kigen was joined at the finish line in the city's Festival Hall by his eight year old daughter, Patience, and it was that virtue which won her father the race. At 30km Rotich had shot out of the pack of 15 Kenyans to take a 50m lead. Kigen and Peter Kiprotich set off in gradual pursuit. "I knew he went too fast," Kigen said of Rotich's spurt, "and I knew if I ran steadily, I would catch him." Former steeplechase world record holder, Wilson Boit Kipketer improved his best by four minutes, finishing 16th in 2:13:08. But he's running out of years in his avowed pursuit of Haile Gebrselassie's world record of 2:04:26. Dieter Baumann, Olympic 5000 metres champion in 1992, made a brief comeback to competition, finishing his first marathon, for charity, in exactly 2:30:00. The women's race looked for a long time like a procession behind the veteran Russian, Svetlana Zakharova, making her comeback after the birth of her daughter. She gradually went away from the field and was a minute ahead at 30km. Melanie Kraus had been over a minute behind at halfway but worked her way through from sixth, to catch Zakharova at 40km. Zakharova only just held off fast finishing Kirsten Otterbu. A beautiful, blue-sky, sunny day and cool temperatures greeted 21,226 starters, but they also faced stiff breezes along the Potomac River for the 32nd running of the 4th largest marathon in North America writes Alan Brookes. True to its name, "The People's Marathon", which offers no prize money, was won by no-name athletes: 33 year old Ethiopian Tamrat Ayalew, who now calls Atlanta his home and 28 year old Kristen Henehan of suburban Washington. Ayalew surged away from a disappointed Mexican Marine, Ruben Garcia, at 21 miles, frustrating Garcia's hope of becoming the first 3-time winner. Henehan, a political lobbyist in the American capital, said she entered to run her first marathon for fun. After running with a group of three from the 4 mile point, she got by another local runner, Lisa Thomas, in the last half mile to complete her debut with a large smile. The real story of the Marine Corps Marathon is its wonderfully scenic course through the parklands along the banks of the Potomac. 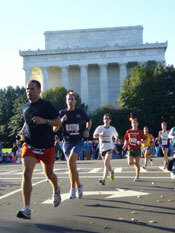 Its route showcases the White House, the Capitol Building, the Lincoln and Jefferson Memorials, the Washington Monument, the Pentagon and the famous Iwo Jima Monument at the finish line. It is about the legions of Marines who put on a technically excellent race for the average runner, who finishes somewhere around 5 hours. Fully one-third of the entrants were first-time marathoners, and 40% were women, greeted warmly in the largest PR exercise of the year for the USMC. Although it attracts runners from 50 countries the race is dominated by Americans from all 50 states, drawn to their country's capital. Just 716 of 30,715 entrants were international runners this year. In contrast, 1,486 active duty marines ran the race. Robin Platt, a 52 year old from the Chicago area finished with his 17 year old daughter, Amanda, in 5:26:34, running in memory of his godson, 26-year-old Colby Umbrell, a 1st Lieutenant Army Ranger who was killed in Iraq in May. 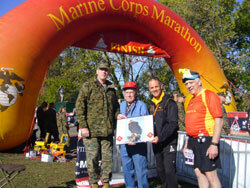 Fifty-seven year old David Johnson ran 6:48 in honour of his father, 84 year-old Elvin Johnson, a veteran of Iwo Jima. The DC Mayor, 36-year old Adrian Fenty, led by example in clocking a speedy 4:10:50. The third edition of the race took place on a bright and sunny day in Castellsdefels, a town located 15km south of Barcelona. The course runs mostly along the Mediterranean Sea with the start and finish located at the Olympic canal, the venue used for the canoeing events in the 1992 Olympic Games. Victor Gonzalo, who won the first edition, won again, this time with a new course record. In the women's race Angelina Miro finished one minute ahead of 58-year old Emilia Vaquero, who had also finished second last year. Fresh from his 2:12 in Berlin, Nacho Caceres won the 10km while Morocco's Kenza Wabhi took the women's event. A total of 1051 runners finished the races. Victor Mangusho beat Charles Yabei by 24 seconds after a thrilling duel. Elijah Mutai, who won for four consecutive years, finished fifth this year. In total more than 20,000 runners participated.